Sport is an essential element to the American way of life. Sport promotes comradely, teamwork, competitive spirit, strive, work ethic. Since we are children we play in little leagues, junior leagues and varsity sports, college teams, and the best of us advance as far as minor and major professional leagues. Some also excel at fantasy sports and take it quite seriously as a favorite hobby. Let’s face it; one does not risk an injury playing fantasy league sports. People internationally love sport with passion and watching or playing sports is one of the favorite pass time of people all around the globes from different walks of life. To some, sport is a common denominator, something that unites and inspires. Therefore, it is essential to properly recognize those factors that help people excel in sports, such as dedication, hard work, strive to improve, enthusiasm, team player, commitment to success. In addition, to exceptional players, it is also important to remember the people who assisted in brilliant athletic performances such as coaches, event sponsors and even organizers. At Crystal Art USA, we offer a plethora of sports trophies and gifts that celebrate and commemorate athletic achievements. 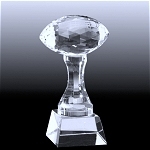 We offer crystal baseball trophies, basketball trophies, tennis trophies, volleyball trophies, football trophies and soccer trophies. Some of our crystal sport trophies come in multiple sizes, and the trophies are offered at an affordable range of prices. In addition, we also offer an exclusive selection of crystal golf cups and crystal golf trophies for the avid golfers with most discriminative tastes. 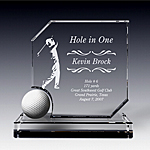 If you wish to celebrate the rare Hole-In-One, and display that lucky ball, we offer a classic crystal Hole-In-One trophy. We also offer truly impressive and coveted crystal golf bowls. If you are looking for a golf tournament trophy, we have a great crystal trophy selection of styles, shapes and sizes to choose from. For example, our super golf crystal award and our century golf tower as well as the regency golf trophy have been very popular with tournament trophies. In the past 10 years, poker has exploded as American favorite past time. 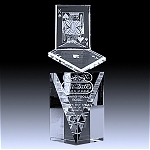 Many Poker celebrities receive world recognition status and Poker tournaments are televised during prime times. Hence, we created the following poker trophies: royal flush trophy and big slick trophy that have been received extremely well by the poker community.